As part of the recent revamp of the Labyrinthos office, we took the opportunity to reorganize our photo archive, and part of that process involved rehousing our extensive collection of vintage postcards and paper ephemera featuring labyrinths and mazes. The postcards alone fill two large card albums, and this being England, there are a number that feature the historic hedge maze at Hampton Court. This one, one of our favourites, dates from the first decade of the 20th century, and features some perplexed looking ladies with large hats and period dresses. 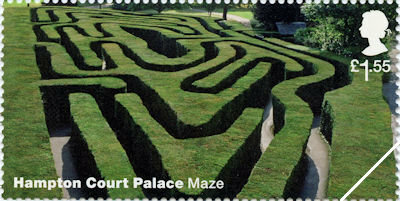 We were very pleased to find a new addition to our collection of Hampton Court cards, one just issued by the British post office that features a new postage stamp (issued 31 July 2018) showing the maze in all its modern glory. 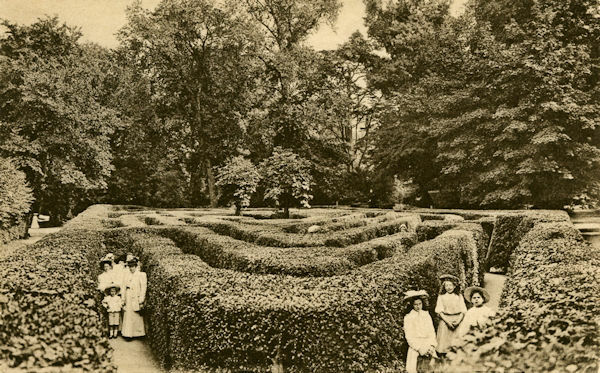 This is just another part of the ongoing story of this iconic and quintessentially English hedge maze that is now well over 300 years old – probably one of the oldest surviving hedge mazes in the world. How lovely to have such an extensive collection of gorgeous documents! I love the progression over time and so appreciate the wealth of history and lore that you and Jeff bring to us all!